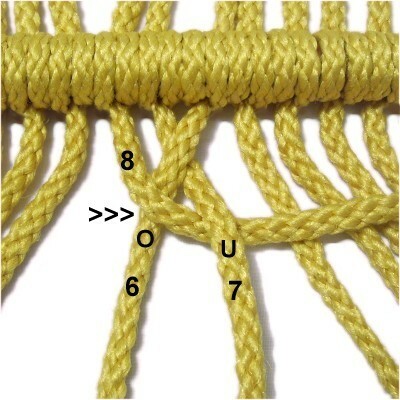 Description: The Clew Knot is an interesting decoration that is sometimes seen in manufactured hammocks. 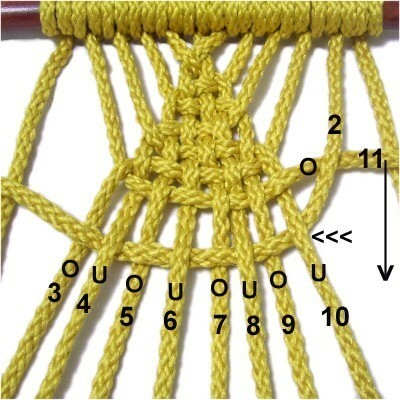 Its a type of weaving where the cords are gathered together to form a V shaped design. At the top they are attached to a ring, and at the bottom, a dowel. 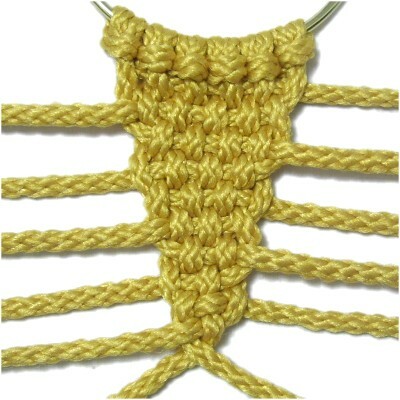 You can also use this design as part of wall hanging projects. 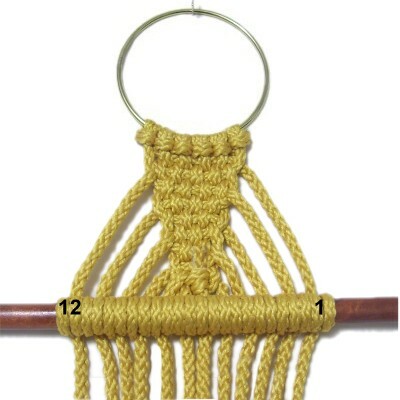 Included on this page are instructions for making the Clew Knot in reverse, which is sometimes necessary when creating hammocks. 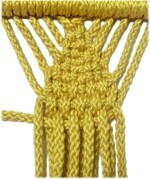 Preparation: To practice, fold six 36-inch cords in half and mount them to a ring with Larks Head knots. Secure the ring close to the back of your board, with the cords heading toward you (forward). I recommend the first time you practice the Clew Knot, you attach the cords to a ring that's at least 4 inches in diameter, so you can spread them out more easily. You can also secure them directly to your board when practicing. Important Tip: When making a Hammock, sometimes you work from one end to the other. In that case, it's better to mount the cords to this first ring with REVERSE Larks Head knots, so you can attach the cords to the second ring with Double Half Hitches. Stretch the cords so they have tension and secure them close to the front of your board. Mentally number the cords 1 - 12, moving left to right. 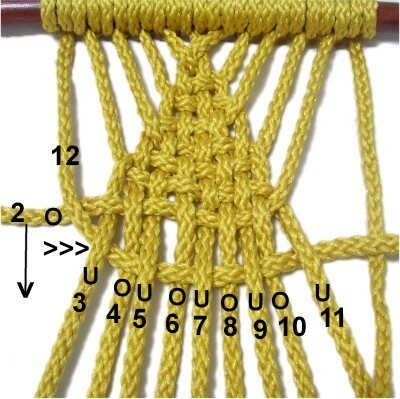 This chart provides a general overview of the weaving process. 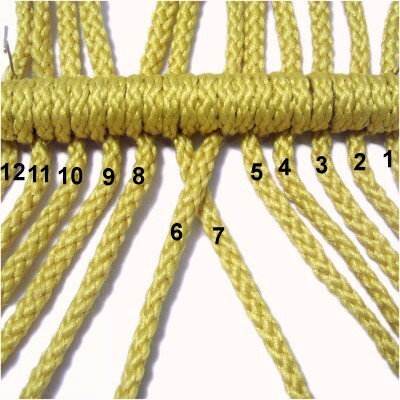 After you weave the cords, secure them off to the side, since they are used only once. Step 1: Select cord 1 on the left, passing it under cord 2 to start the weaving. Alternate under and over all the remaining cords, moving left to right horizontally. Pull cord 1 to tighten, after moving it close to the Larks Head knots (see next image). Step 2: Move cord 12 under cord 11. Weave it through the remaining cords right to left. The over - under pattern has changed, so it's now the opposite of the previous row. Push cord 12 close to cord 1 and secure it. Step 3: Move cord 2 over cord 3, then weave it under and over the other cords left to right. 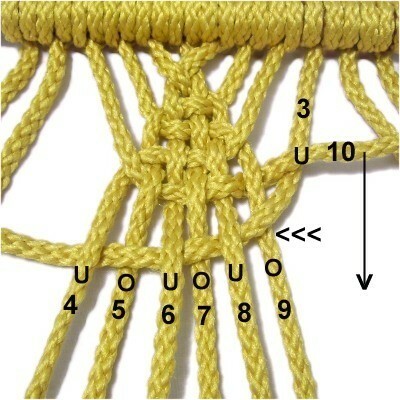 Designer's Tip: It's important to change the over - under pattern in each step, so the weaving for the Clew Knot alternates. That means the cord you are using to do the weaving will sometimes pass over a cord as you begin, and other times it will pass under it. 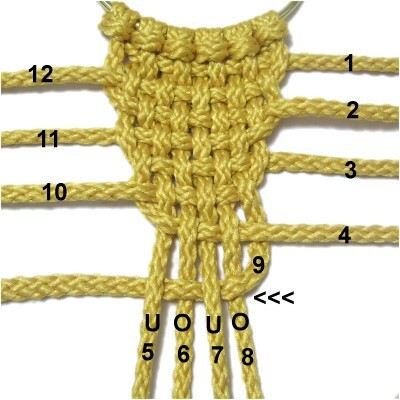 You also alternate by using one cord from the left, followed by one from the right. Always push the cords close together after each one is used. You will do a final tightening later on. Step 4: Move cord 11 over cord 10, then weave it under and over the remaining cords right to left. 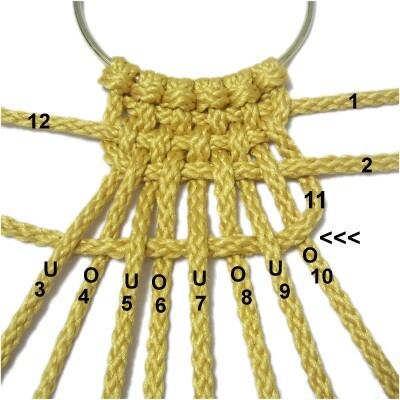 Step 5: Move cord 3 under cord 4, then weave it under and over the others left to right. 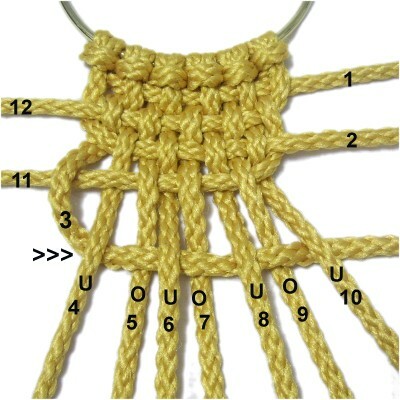 Step 6: Move cord 10 under cord 9, then weave it through the others from right to left. Step 7: Move cord 4 over cord 5, then weave it through the remaining cords left to right. Step 8: Move cord 9 over cord 8, then weave it through the remaining cords right to left. 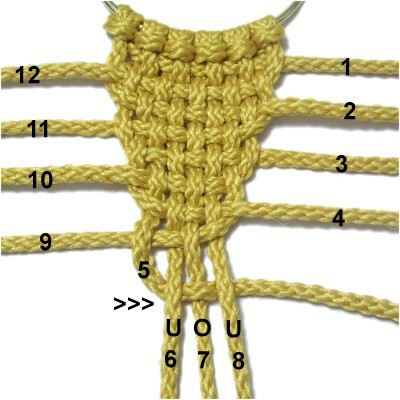 Step 9: Move cord 5 under cord 6, then weave it over cord 7 and under cord 8. Step 10: Move cord 8 under cord 7 and over cord 6. 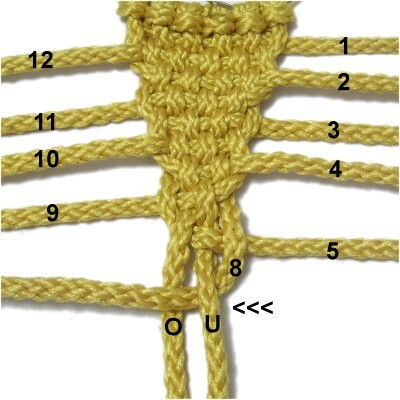 Pull each cord firmly to tighten the Clew Knot, starting with cords 1 and 12. 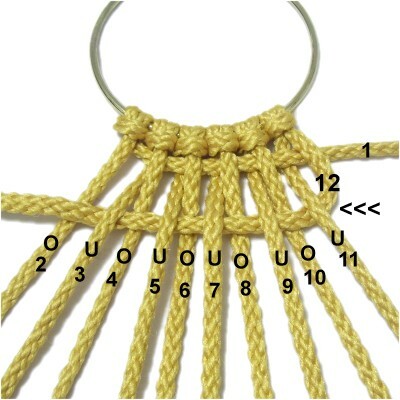 Step 11: To complete the design, you must do something with cords 6 and 7. 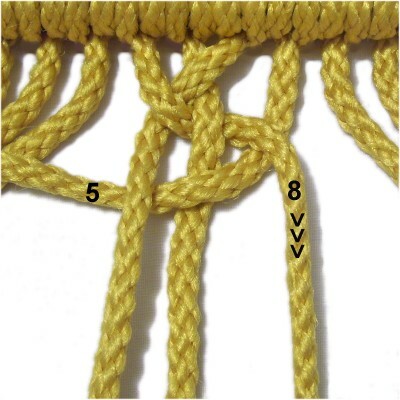 You can simply cross cord 6 over 7, if you plan to place the dowel close to the knot (see images below). When adding space between the Clew Knot and the dowel, tie a Half Hitch with cord 7 (onto cord 6) to keep the weave from loosening. When using a dowel, attach cords 6 and 7 first, placing them at the center. 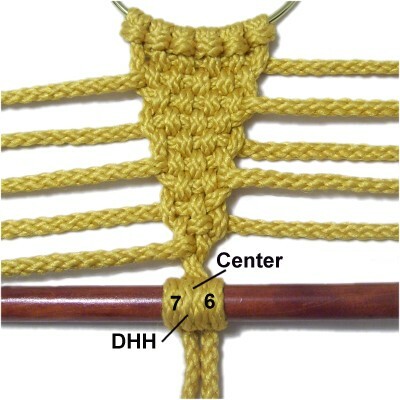 The best knot to use is the Double Half Hitch (DHH). Attach cords 8 and 5, followed by 9 and 4. Attach cords 10 and 3, followed by 11 and 2. Cords 12 and 1 are the final pair, attached to the right and left of the others. 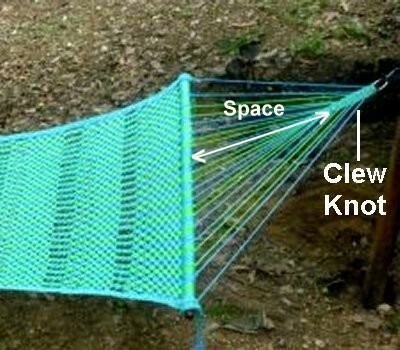 Some hammock patterns are made from one end to the other. 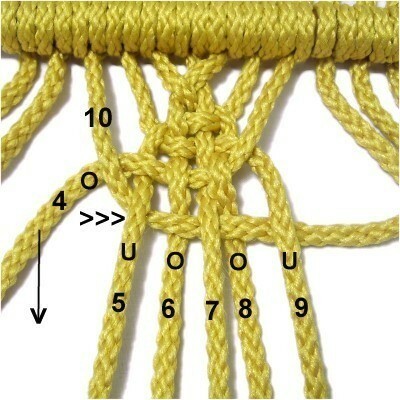 The instructions below show you how to make this knot in reverse, from the dowel to the second ring. 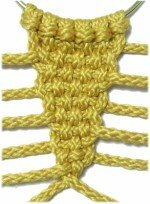 Preparation: To practice, attach 12 cords to a dowel with Double Half Hitches, to mimic what you would find in a Hammock design. Secure the dowel to your project board horizontally, so the cords are vertical and heading toward you (forward). 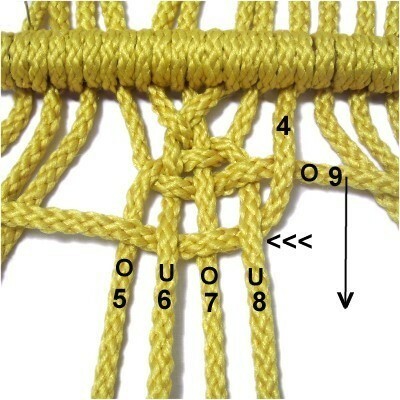 Step 1: Mentally number the cords 1 - 12, moving right to left, since you are making the knot backward. Cross cord 6 over 7, and secure both cords near the front of your board. Step 2: Move cord 8 over cord 6 and under cord 7, arranging it horizontally (left to right). 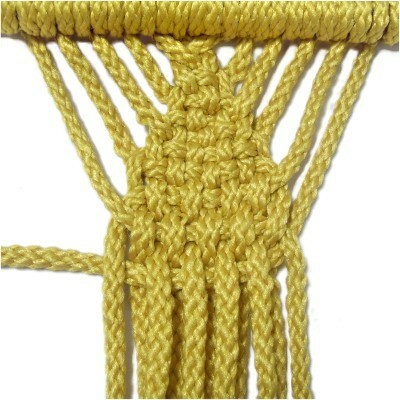 Designer's Tip: After you weave a cord horizontally, leave it that way until the next step. This makes it easy to identify. The next cord will either pass over or under it, then the next row of weaving is done. Step 3: Move cord 5 under cord 8, then curve it to the left, passing over cord 7 and under cord 6 horizontally. Remember that the weaving for each row needs to alternate, so always compare the rows to make sure the under - over pattern changes. 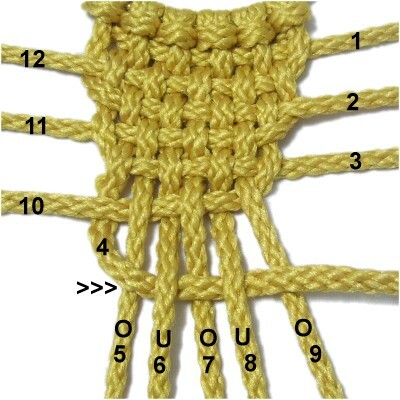 Designer's Tip: After you complete a row of weaving, arrange the previous cord vertically. In this case, that's cord 8. The only one that should remain horizontal is the cord most recently used. Step 4: Move cord 9 under cord 5, then alternate over and under cords 6 - 8 (left to right). Move cord 5 forward vertically, and secure it next to cord 6. Step 5: Move cord 4 over cord 9, then alternate over and under cords 8 - 5 (right to left). Move cord 9 forward vertically and secure it. 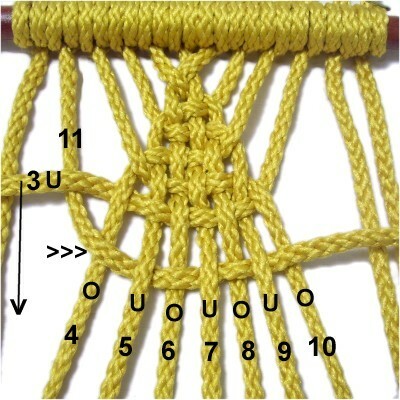 Double check to make sure all the vertical cords have tension, which makes it easier to weave the Clew Knot. Step 6: Move cord 10 over cord 4, then alternate over and under cords 5 - 9 (left to right). Bring cord 4 forward, and secure it next to cord 5. Step 7: Move cord 3 under cord 10, then alternate under and over cords 9 - 4 (right to left). Bring cord 10 forward and secure it. Check the tension on all the cords. You can now spread them out slightly if necessary. Step 8: Move cord 11 under cord 3, then alternate over and under cords 4 - 10 (left to right). Bring cord 3 forward, next to cord 4. Step 9: Move cord 2 over cord 11, then alternate over and under cords 10 - 3 (right to left). Increase the tension of all the cords, so the next two rows of weaving will be easier to make. Step 10: Move cord 12 over cord 2, then alternate under and over cords 3 - 11 (left to right). 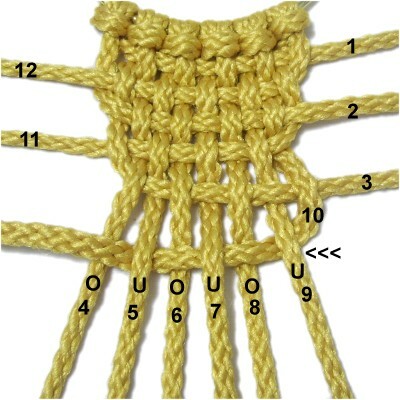 Step 11: The final row is made with cord 1. 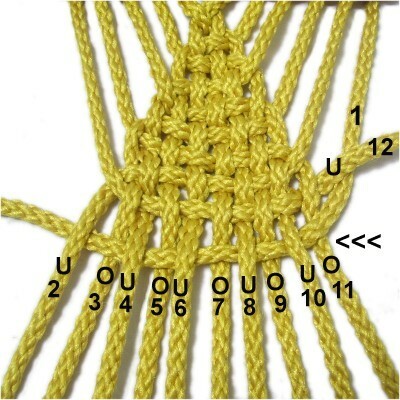 Bring it under cord 12, then weave it through all the others from right to left. 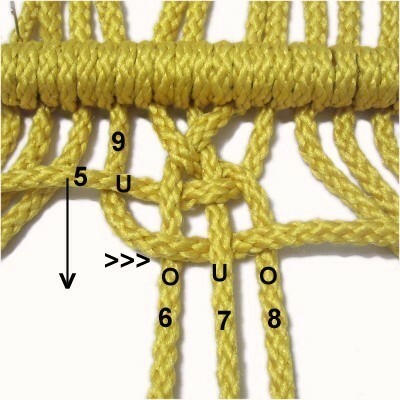 Step 12: Tighten and adjust the Clew Knot by pulling each cord gradually, from where it starts on the dowel to the end of it. 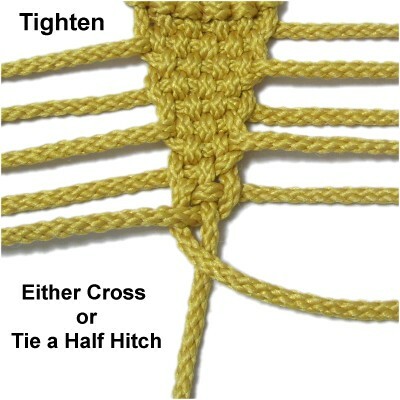 Keep the knot flat as you work. 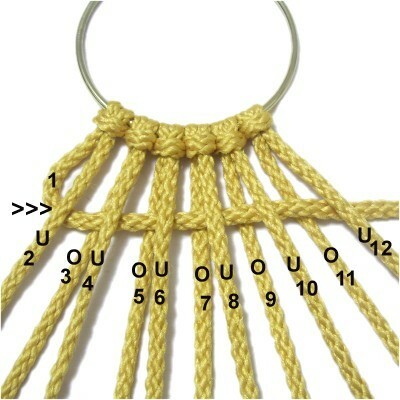 When making a Hammock, you would now attach the cords to another ring. 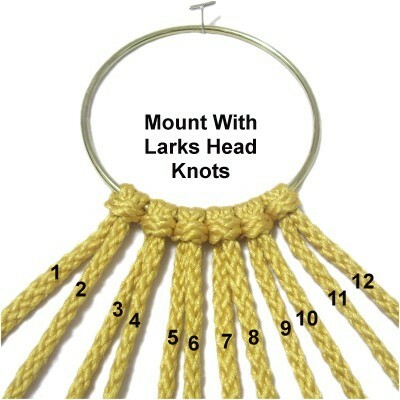 You would have mounted the cords to the first ring with reverse Larks Head knots, so you can attach the cords to this ring with Double Half Hitches. Attach the cords from the center working outward to the right and left. So the first cords on the ring are 6 and 7. 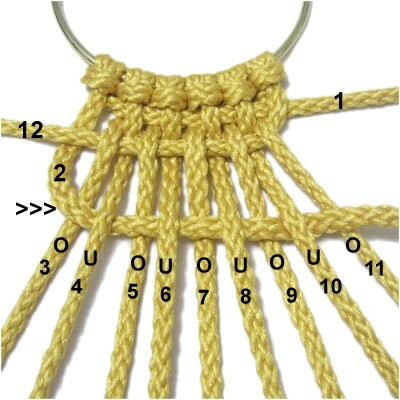 Tighten each knot firmly, so the ring rests close to the last row of weaving. 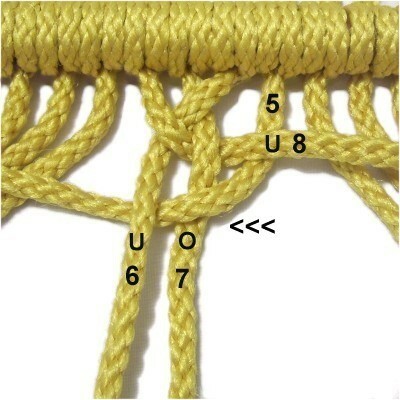 Have any comments about the Clew Knot? Contact Me.